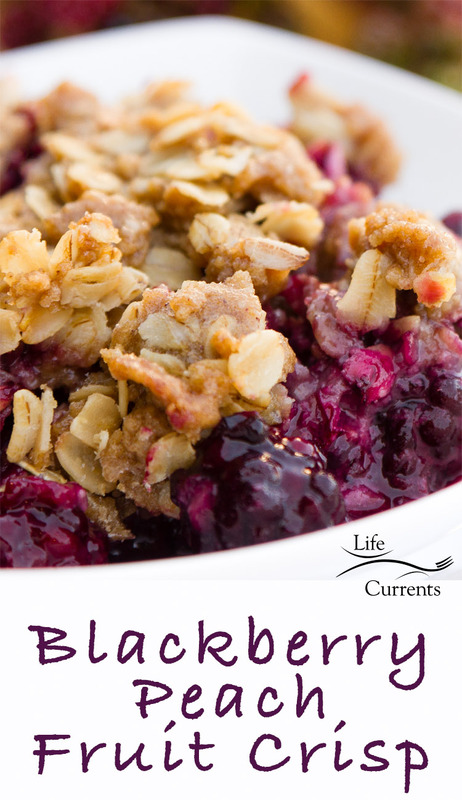 This Blackberry Peach Fruit Crisp with Oatmeal Cookie Crumble is my favorite fruit crisp. Loaded with fresh juicy tart blackberries, sweet summer peaches, and topped with a crumbly oatmeal brown sugar streusel – this is the fruit crisp you want to nosh on! Part of the reason I love it is because I always have the ingredients in my cupboard. Just pick up some fresh juicy fruit, and you’re in fruity heaven! Of course, I also love it because it’s so yummy. It’s perfect hot out of the oven topped with a big spoonful of vanilla ice cream. Great with some whipped cream as an after dinner treat. Divine as a breakfast start to the day topped with some vanilla yogurt. I’ve even eaten it straight out of the fridge, cold and yummy. I’m pretty lucky, as the blackberries I get to use are all wild blackberries that I picked. These blackberries are a little tart, so I added the peaches and a little sugar for sweetness. Taste your fruit to see if it’s tart or sweet, and add sugar as needed. For the brown sugar, light or dark will work – use whichever you have. Other blackberry desserts you’ll love! Place the blackberries in a large bowl, and mash a few of them with a large spoon or fork. Stir in peaches and quick-cooking tapioca. Taste to see if the fruit needs any sugar. Set aside, and make the topping. Whisk the brown sugar and the flour together in a large mixing bowl. Add butter, cutting it in with a pastry blender or a fork until the mixture is crumbly. Stir in oats and cinnamon, blending until clumps form. Place the fruit mixture in a 9x9-inch pan, and top with the crumble. Bake in a 350° F oven about 30-40 minutes, or until filling is bubbling and topping is brown and crisp. Let cool at least 15 minutes before digging in. I love the topping!!! YUM!!!!! This looks great! This sounds and looks fantastic, especially that streusel topping – delicious! Blackberry Pies are my favorite and I can just imagine how good this is with peaches also. Love the oats in the topping too. I ADORE blackberries. This looks like a great, easy, crisp. I love how unfussy crisps are! Oatmeal crumbles are so good, I love the crispy texture! This looks like a great combo.